The U.S. government and the Russian government have both been forced into positions where neither one of them can afford to back down. If Barack Obama backs down, he will be greatly criticized for being “weak” and for having been beaten by Vladimir Putin once again. If Putin backs down, he will be greatly criticized for being “weak” and for abandoning the Russians that live in Crimea. In essence, Obama and Putin find themselves trapped in a macho game of “chicken” and critics on both sides stand ready to pounce on the one who backs down. But this is not just an innocent game of “chicken” from a fifties movie. This is the real deal, and if nobody backs down the entire world will pay the price. Leaving aside who is to blame for a moment, it is really frightening to think that we may be approaching the tensest moment in U.S.-Russian relations since the Cuban missile crisis. There has been much talk about Obama’s “red lines”, but the truth is that Crimea (and in particular the naval base at Sevastopol) is a “red line” for Russia. There is nothing that Obama could ever do that could force the Russians out of Sevastopol. They will never, ever willingly give up that naval base. 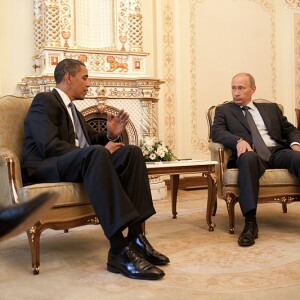 So what in the world does Obama expect to accomplish by imposing sanctions on Russia? By treaty, Russia is allowed to have 25,000 troops in Crimea and Russia has not sent troops into the rest of Ukraine. Economic sanctions are not going to cause Putin to back down. Instead, they will just cause the Russians to retaliate. Language like that is going to make it even more difficult for Obama to back down. On Thursday, Obama announced “visa restrictions” on “those Russians and Ukrainians responsible for the Russian move into Ukraine’s Crimean Peninsula”, and a House panel passed a “symbolic resolution” that condemned Russia for its “occupation” of Crimea. But those moves are fairly meaningless. Leaders from both political parties are now pushing for very strong economic sanctions against Russia, and there does not appear to be many members of Congress that intend to stand in the way. If the U.S. does hit Russia with harsh economic sanctions, what is going to happen? Is Russia going to back down? -The U.S. slaps economic sanctions on Russia. -Russia seizes the assets of U.S. companies that are doing business in Russia. -The U.S. seizes Russian assets. -The Russians refuse to pay their debts to U.S. banks. -The U.S. government hits Russia with even stronger sanctions. -Russia starts dumping U.S. debt and encourages other nations to start doing the same. -The U.S. gets Europe to also hit Russia with economic sanctions. -Russia cuts off the natural gas to Europe. As I noted the other day, Russia supplies more than half the natural gas to a bunch of countries in Europe. -The United States moves troops into western Ukraine. -Russia starts selling oil for gold or for Russian rubles and encourages other nations to start abandoning the U.S. dollar in international trade. Of course the order of many of these moves could ultimately turn out to be different, but I think that you can see the nightmare that this game of “chicken” could turn out to be. And what would be the final result? Nothing would be resolved, but the global economy would greatly suffer. Crimea’s parliament voted to join Russia on Thursday and its Moscow-backed government set a referendum on the decision in 10 days’ time in a dramatic escalation of the crisis over the Ukrainian Black Sea peninsula. The sudden acceleration of moves to bring Crimea, which has an ethnic Russian majority and has effectively been seized by Russian forces, formally under Moscow’s rule came as European Union leaders held an emergency summit groping for ways to pressure Russia to back down and accept mediation. The Obama administration is calling the upcoming referendum “illegal” and says that it will not respect the will of the Crimean people no matter how the vote turns out. The decision, which diplomats said could not have been made without Putin’s approval, raised the stakes in the most serious east-west confrontation since the end of the Cold War. The vice premier of Crimea, home to Russia’s Black Sea Fleet in Sevastopol, said a referendum on the status would take place on March 16. All state property would be “nationalized”, the Russian ruble adopted and Ukrainian troops treated as occupiers and forced to surrender or leave, he said. What we need is someone with extraordinary diplomatic skills to defuse this situation before it spirals out of control. Unfortunately, we have Barack Obama, Valerie Jarrett and John Kerry running things. So why is Ukraine such a big deal anyway? The Ukraine is strategically-important for a number of reasons. It sits astride enormous petroleum and natural gas deposits found in the Black Sea region. The nation is also home to an extensive network of liquid natural gas pipelines which crisscross it; control the Ukraine and you control its pipelines – and thus the flow of energy into the hugely-lucrative European market. Western energy firms such as Exxon-Mobil, BP-Amoco and Chevron are locked in competition with the Russian energy giant Gazprom – for control/exploitation of as-yet-undeveloped petroleum deposits not only in the Ukraine, but in neighboring Poland and Romania. Fracking technologies and other new extraction methods have only added urgency to the competition. Income from fossil fuels development is the lifeblood of the new Russian economy. Threats to the regional hegemony of Gazprom are likely to be treated by Putin and Russia with the utmost urgency and seriousness. The Crimean Peninsula is also home to the Black Sea fleet of the Russian navy, which leases its base at Sevastopol from the Ukrainian government. Since the Black Sea – via the Dardanelles – provides the only warm-water base with access to the Mediterranean Sea – it is of enormous importance to Russia. Its loss would be a crippling blow to the Russian fleet. Finally, the Ukraine – once known as the “bread basket of Europe” – is home to arguably the finest temperate agricultural region in the world. Its topsoil is widely-acknowledged by agronomists to be among the world’s best. Control the Ukraine and you control the grainery of Europe – and can exert tremendous leverage upon worldwide grain agricultural commodities prices. If the U.S. insists on playing a game of brinksmanship over Ukraine, the consequences could be disastrous. If the Kremlin demands Gold bullion (or even Russian Rubles) for oil payments, then the interventions to subvert the Ruble currency by the London and Wall Street houses will backfire and blow up in the bankster faces. Expect any surplus Rubles would be converted quickly to Gold bullion. If the Chinese demand that they are permitted to pay for oil shipments in Yuan currency, then the entire Petro-Dollar platform will be subjected to sledge hammers and wrecking balls. The new Petro-Yuan defacto standard will have been launched from the Shanghai outpost. If the Saudis curry favor to the Russians and Chinese by accepting non-USDollar payments for oil shipments, then the Petro-Dollar is dead and buried. In addition, if Russia starts dumping U.S. debt and gets other nations (such as China) to start doing the same, that could create a nightmare scenario for the U.S. financial system very rapidly. So let us hope and pray that cooler heads prevail. In my recent article entitled “The Top 12 Signs That The U.S. Economy Is Heading Toward Another Recession“, I discussed how the U.S. economy appears to be hurtling toward another major downturn. And on Thursday, we learned that office supplies giant Staples has just announced that it is going to close 225 stores. Even without this major international crisis, the U.S. economy would still be deeply troubled. But if the United States and Russia do declare “economic war” on each other, all hell could start breaking loose. -The U.S. government seems absolutely determined to “punish” Russia until it leaves Crimea. -Russia is never going to leave Crimea, and has promised to “respond” harshly to any sanctions. Most Americans are not paying much attention to what is going on in Ukraine, but this is a very, very big deal. In the end, it could potentially affect the lives of virtually every man, woman and child on the planet.